Obituary for Jonas P. Ellwart Sr.
Jonas P. Ellwart Sr., 49, Mosinee, died Wednesday, Jan. 23, 2019, at Bay of Northridge Health and Rehabilitation Center, Manitowoc. He was born Nov. 6, 1969, in Milwaukee, the son of the late Horst and Michelle (DePlanche) Ellwart Sr.
Jonas was a loving father and grandfather. 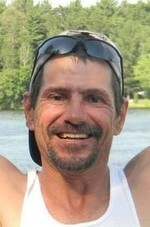 He loved fishing, hunting, and spending time with his family and friends. He was a roofer all if his life and worked for H & N Construction out of Hatley, Wis. Jonas was a happy go lucky guy who always put a smile of every ones face. Survivors include his five children, Jessica (Tony) Singh, Mosinee, Hector Cubero, Green Bay, Rachel (Eric) Moen, Wausau, Jonas Ellwart Jr., Wausau, and Lucas Ellwart, Wausau; eight grandchildren; two brothers, Louis (MaDonna) Elwart, Bowler, and Jonathon (Jamie Tucker) Henke Sr., Antigo; a sister, Elizabeth Singh, Antigo; his stepmother, Beverly Ellwart, Antigo; and his life partner, JoAnn Burkhardt, Wausau. He was preceded in death by a brother, Horst Elwart Jr., and a sister, Susan Kilgore. To send flowers to the family of Jonas P. Ellwart Sr., please visit our Heartfelt Sympathies Store.